Children love swimming, playing outdoor sports and biking, but these activities are also a time for potential tooth related injuries. Many parents and caregivers are experts at dealing with minor accidents such as scrapes, bruises and bumps. However, they may not know what to do for dental injuries such as chipped or knocked out teeth. It’s best to be prepared for dental injuries, because the moments just after a tooth injury can be traumatic. The American Academy of Pediatric Dentistry (AAPD) has some simple recommendations for parents and caregivers to help them manage the most common tooth injuries. Don’t spend time looking for a baby tooth. Baby teeth cannot be placed back into the mouth because it could damage the developing permanent teeth. Rinse the mouth with water and apply a cold compress to reduce swelling. Contact our office as soon as possible. Do not scrub a permanent tooth with soap. Scrubbing the tooth, especially with soap, can damage cells on the root of the tooth necessary for it to reattach. Rinse the tooth gently in cool water. Replace the permanent tooth into the socket and hold it there with clean gauze or a wash cloth. If you can’t put the tooth back into the socket, place it in a clean container preferably with cold milk, or with your child’s saliva. Do not store the tooth in water. Take your child to our office immediately or call the emergency line if it is after hours. The faster you act, the better your chances of saving the tooth. Contact our office immediately. Quick action can prevent infection, save the tooth and reduce the need for extensive dental treatment. Rinse the mouth with water and apply a cold compress to reduce swelling. If you are able to find the tooth fragment, place it in cold milk and bring it with you to our office. Dr. Michelle may not be able to repair the tooth with the broken piece, but they will be able to treat the child, stabilize the tooth and give recommendations for future treatment. Prevention is the best way to avoid dental injuries. 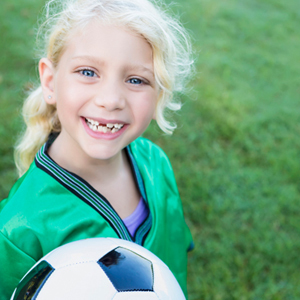 The AAPD recommends children wear mouthguards for sports like soccer, football, lacrosse, hockey, baseball, basketball, wrestling and gymnastics. Additionally, parents and caregivers may want to consider mouthguards for leisure activities like biking, rollerblading and skateboarding. 1. Stock Mouthguard: Preformed plastic tray that fits loosely over the teeth. This mouthguard offers the least amount of protection and can be found at sports stores. This is the low cost option. 2. Mouth Formed (“Boil and Bite”) Mouthguard: The most common type. The plastic is softened in hot water and adapted to teeth by finger, tongue and biting pressure. This mouthguard offers a moderate amount of protection and can be found at sport stores. This the moderate cost option. Prevention is essential to keeping yourself and your children safe while having fun. As always, it is important to visit your dentist regularly and to maintain good oral health. toddler or child’s dental checkup. Start children now on a lifetime of healthy bytes. Little Bytes Pediatric Dentistry is dedicated to providing your child with the highest quality of oral health care and education in a modern, fun and nurturing environment.